Engaging your students and members. Practice creative dances and movements. Promote your school to the public. Display your banner. Give out promotional materials. Recruit from the public. Arts, dance, performance school or studio. If you already registered or joined the parade in one of previous years, please sign in using your email and check the action required for the next step. This is a family-friendly event and public safety is our first priority. No sharp weapon (please use plastic or wood, if you have to use metal, please cover the sharp blade or tip). 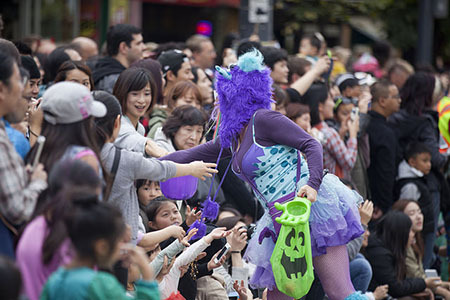 Please read the complete Rules and Regulations of Vancouver Halloween Parade & Expo. 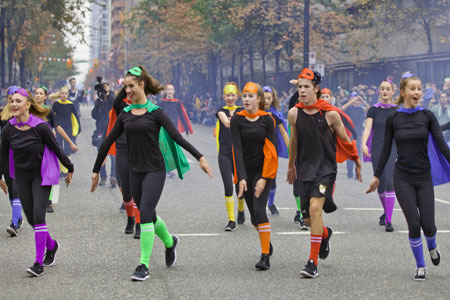 We provide artist grant to support the teacher's choreography for the parade. You may bring students and vehicles to perform on the parade and promote your school's banner to the public. If you are a musician, you may apply the artist grant as a marching band as well. Application must be submitted to the parade office on or before Wednesday Sep 25, 2019. All application fees include $40 membership fee at Vancouver International Halloween Festival Society.